Passed away on the 5th of April 2019, aged 74 years. Dearly loved husband of Julyana. Father of Paul, Jody-John, Tania, Tommy, Niki, and their partners. Beloved Jonny to all of his Grandkids and Great-grandchild. 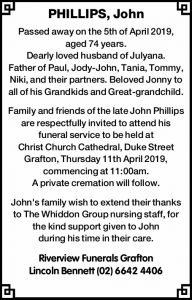 Family and friends of the late John Phillips are respectfully invited to attend his funeral service to be held at Christ Church Cathedral, Duke Street Grafton, Thursday 11th April 2019, commencing at 11:00am. A private cremation will follow. John’s family wish to extend their thanks to The Whiddon Group nursing staff, for the kind support given to John during his time in their care.